With over $5 million raised so far, Ouya has made waves as a crowdfunding mega-success. But, when it comes to hardware, there's been precious little to help visualize what have people been throwing their money at. Not any more. Today, the project's Kickstarter page revealed new looks at designs for the console and controller that thousands of backers are helping to turn into reality. Of course, the biggest different from gamepads of the current generation is the big, circular touchpad in the center of the controller. 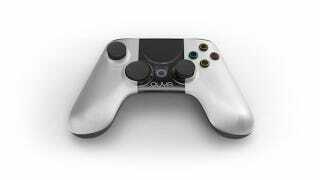 The controller's layout is similar to an Xbox 360's, with offset analog sticks. The face buttons have colored circles on them, but the post notes that this may change. Ouya's also announced that OnLive will be available on the device, meaning that the cloud gaming service's library of AAA and indie games will be playable on the console.